“`Tomorrowland was originally called World of Tomorrow. Frontierland was Frontier Country. Lilliputian Land never came to fruition at Disneyland. And, Star Wars Land opening in 2019 was creative folly. “`Walt Disney spent a marathon weekend in 1953 brainstorming ideas for a family amusement park, called Disneyland. There would be a Train Station and old-fashioned Main Street Square. The park would have a princess castle, a pirate ship, and maybe even a rocket. Disney wanted to get investors on board. 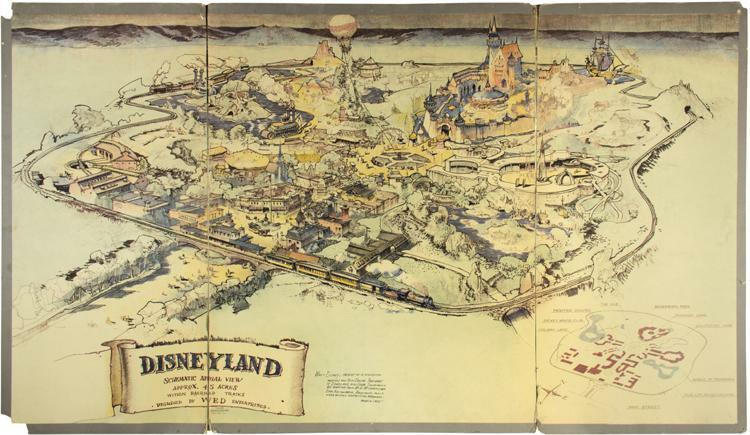 Walt described the elements he imagined to artist Herb Ryman, who translated them into a hand-drawn map — conceptual origins of a Disneyland theme park. “`The famous Sleeping Beauty Castle that sits in the center of the park is displayed further back in the concept sketch. The Matterhorn Bobsleds and the Monorail were added in 1959. The Enchanted Tiki Room opened in 1963. It’s a Small World arrived in 1966, followed with Pirates of the Caribbean in 1967. The official Disneyland Hotel opened in 1988. A new park, Disney California Adventure, and accompanying Grand Californian Hotel, added in 2001. “`None of those elements were part of Ryman’s 1953 sketch. It is hard to compare designs from the original map with what actually exists in the park, today. 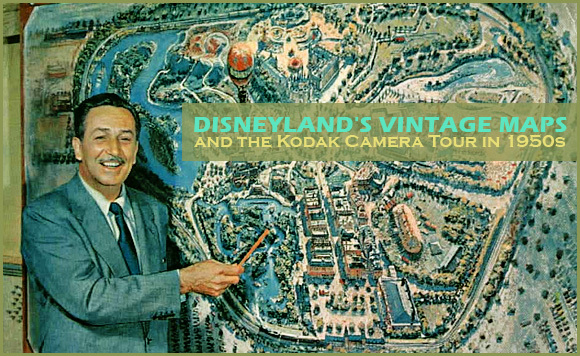 “`For the auctioneer, whose Van Eaton Galleries are full of Disney animation cells, old park souvenirs, and even, a googly-eyed sea monster from the now-shuttered Submarine Voyage ride, the pre-Disneyland map is treasure. After spending the past four decades locked away in a vault, the map is being showcased in a public viewing at the gallery prior to the auction. “`It could be yours. That original concept art could fetch as much as $1 million when it goes up for auction, next month. This entry was posted on Friday, May 12th, 2017 at 12:04 am	and is filed under Blog by Manny Pacheco. You can follow any comments to this post through the RSS 2.0 feed. Responses are currently closed, but you can trackback from your own site.